Maria Evans began writing professionally in 2009. She writes for grassroots advocacy efforts as an independent contractor and has conducted health care and public policy research. Evans has a Master of Public Health from George Washington University. Olive oil is a healthy substitute for butter. One tbsp. of olive oil has 120 calories and 14 g of total fat, including 12 g of unsaturated fat. Olive oil contains no trans fats or cholesterol. Salted butter has 102 calories per tbsp. and 11.5 g of total fat, of which 7 g are saturated. Butter also contains 31 mg of cholesterol. Excess monounsaturated fats, a low saturated-fat content and an absence of cholesterol make olive oil a better alternative than butter for the heart. Convert butter measurements to olive-oil measurements for your recipes. One tsp. of butter can be replaced by 3/4 tsp. of olive oil; 2 1/4 tsp. of olive oil can be used instead of 1 tbsp. of butter. Replace 1/4 cup of butter with 3 tbsp. of olive oil and 1/3 cup of butter with 1/4 cup of olive oil. One-half cup of butter can be substituted for 1/4 cup plus 2 tbsp. of olive oil; replace 2/3 cup of butter with 1/2 cup of olive oil. Replace 1 cup of butter with 3/4 cup of olive oil. Substitute 3/4 cup of butter with 1/2 cup plus 1 tbsp. of olive oil. Use these conversions for baking, sautéing or frying. Spread or spray olive oil onto breads to which you would normally add butter, including garlic bread, French bread, bagels and toast. 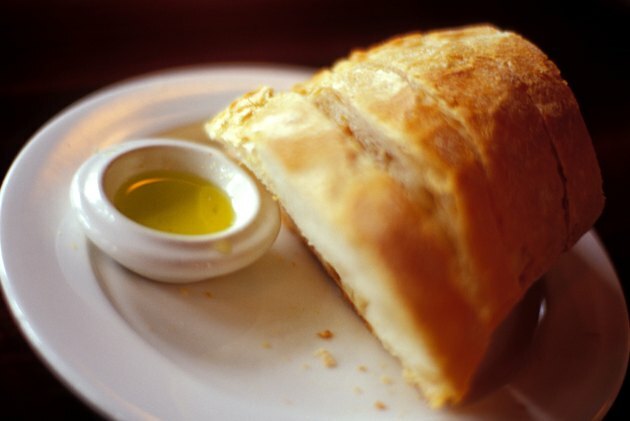 Pour olive oil into a small bowl and dip your breads into the oil for flavoring. Use an olive-oil spray to coat your pans when frying and baking instead of adding a layer of butter. This will add flavor and moisture to your meals as well as prevent your food from sticking to your pans. Purchase extra-virgin olive oil or virgin olive oil to ensure quality and preserve flavor. Use virgin olive oil, which is less expensive, for baking, frying and sautéing and extra-virgin olive oil for uncooked dishes such as side salads or breads.